We're joining forces with the Tahoe Food Hub and Sierra Business Council for a happy hour on Tuesday, June 14th from 5:30 - 7 pm, in the Tahoe Food Hub farm shop, located downstairs from the Mill. It'll be a Tahoe/Truckee "Green Drinks" gathering, in support of local sustainability, but it'll also an open house for the Food Hub—plus, they'll have seedlings for sale. All are welcome. There will be free appetizers and drinks, plus a chance to get to know your neighbors. Join us at the Tahoe Mill Collective for a panel discussion on Thursday, March 24 from 5:30 - 7 on how to launch your own company, with real and honest insight into the front lines of entrepruenership in Tahoe. We'll have speakers from local brands like Arcade Belts, Tahoe Made Apparel, Flylow Gear, Buttermilk Apparel, and more. Free entry and all are welcome! Drinks and appetizers included as well. Let It Snow: Holiday Party! Are you a DIY addict? Garage sale regular? Flea market troller? Found objects can be a great and inexpensive way to making one-of-a-kind pieces of functional art. Lauren, a local artist at Folklaur Studio, will demonstrate how she takes what other people don't want and makes in into all kinds of functional lighting pieces with personality. This workshop will go through the basics of lamp making, procedures, tools and parts, and how to transform your favorite hunks of junk into unique light fixtures. The demonstration will detail a small lamp made from the woodpile and pieces from the hardware store. Kits will be available for a nominal fee ($15) so attendees can make their own version right at the workshop. Those interested in purchasing a kit should preregister to ensure that the right amount of kits will be available. Please also bring along a small flathead screwdriver and needle nose pliers. Preregister by April 21 by emailing info@tahoemill.com to let us know you'd like to join the workshop! What: Sierra Watch open house at the Tahoe Mill. As winter arrives, and Sierra Watch ramps up efforts to Keep Squaw True in the face of mounting development threats, we're excited to announce the opening of our Keep Squaw True campaign office. To celebrate, you are invited to join Sierra Watch staff and friends for a happy hour on Thursday, Nov. 20 at our new office space at the Tahoe Mill. We’re happy to talk shop if you have questions or information to offer about local conservation issues, but mostly we just want to get to know our neighbors a little better. Appetizers from the Crest Cafe, wine, and beer will be provided. Everyone is welcome so feel free to bring a friend or two. Hope to see you there. It's fall, which means time to cook hearty dishes like stews, soups and more. Come join us at the Tahoe Mil Collective for a fall potluck and a 'Remodel Your Recipes' talk from health coach Jenna Granger. Love certain recipes, but wish they were healthier? Don’t want to go out and buy all new recipe books? Don’t know what makes up a healthy recipe? All of these are valid concerns that many of us have about healthy eating and cooking. This informative talk will inspire and empower you to create healthy delicious meals so that you will feel more vibrant, energized, and healthy in your life. Bonus- bring your favorite dish to share and we can work together in creating a healthier version! This talk will be followed by a potluck! Please bring a dish that you love with copies of the recipe to share with others! Talk offered by Jenna Granger Health Coaching: Jenna Granger is a Health Coach, Wellness Educator, and Art of Living Teacher living in the Tahoe area emphasizing stress-free, mindful eating habits, listening to one's own body, and supporting all aspects of health (it's more than diet and exercise). Full bio here. Health Talk: Are Cravings A Weakness? We've all been there: Standing in a 7-11 parking lot scarfing down an ice cream bar and hoping nobody is watching. That was Tahoe native Jenna Granger before she decided to become a holistic health coach. In this talk, Jenna will lead an interactive discussion about how cravings aren't a weakness; we just need to learn how to deconstruct them to find the source. We will learn how energy levels, the food we are eating, and how all aspects of our lives affect our food cravings and what to do about them. We will have a 45-minute talk followed by questions, discussion, and yes, a healthy food sampling! Jenna has been working as a health coach for the last two years in supporting people in finding balance with diet, lifestyle and exercise. She promotes balance not through restriction or deprivation, but through self love, fun, and empowerment. The event is free and open to the public (and there will be food!). We're hosting a workshop for freelance writers—and those hoping to break into the world of freelance writing—on Wednesday, June 11 from 6-8 p.m. at the Tahoe Mill Collective. All are welcome and the event is free of charge. We'll have three local professional freelance writers and editors moderating the workshop: Former Powder magazine editor Mike Rogge, Moonshine Ink editor Melissa Siig, and ESPN.com editor Megan Michelson. We'll be covering topics from coming up with story ideas, tips on pitching, the reporting and writing process, what it's like to get edited, and how to market and promote yourself and your writing. For questions or to sign up, please email info@tahoemill.com. Coalition Snow, a new Tahoe-based ski and snowboard company for women, will be working this summer with Middlebury College's MiddCore program, a summer course that engages a diverse group of students at Sierra Nevada College in leadership, idea creation, collaboration, financial literacy, strategic thinking, persuasive communication, negotiation, crisis management and design thinking. On Tuesday, June 3 from 7-9 p.m., MiddCore students will be conducting a case study for a project on Coalition Snow, taking place at the Tahoe Mill Collective, and they're looking for women who consider themselves skiers and snowboarders who are interested in participating in the study. "These students will be developing our value proposition and identifying how the value proposition influences key activities of Coalition," says Jen Guecki, CEO of Coalition Snow. "I am hoping that through your participation—and by inviting your friends to join us—that we will be able to create a rich learning experience for this students, while also participating in valuable research for Coalition that will drive our success." If you're a woman in that demographic, you're invited to join! When: Thursday, May 22nd | 6 - 8 p.m.
What: Enjoy wine, live music & hors d'oeuvres with local Tahoe wedding vendors! Whether you work in the wedding industry around Tahoe, are planning an upcoming wedding or event, or just want to meet some local vendors, stop by the Tahoe Mill Collective. Tahoe Mill members are holding a collective yard sale on Saturday, April 19th. We'll be selling loads of great stuff -- ski and outdoor gear, apparel, household goods, furniture, and more. Come check it out! 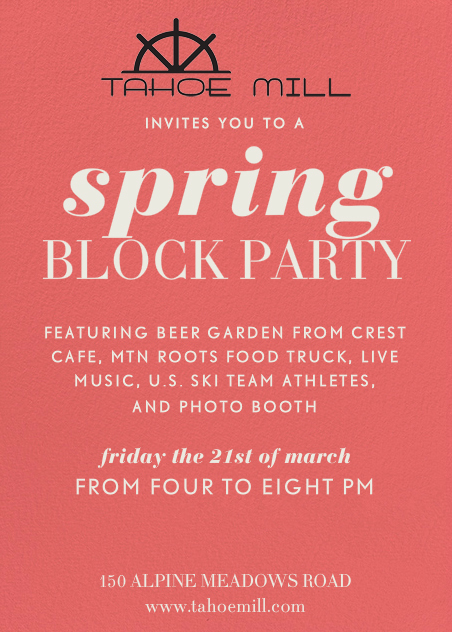 The sun is out, we finally have some snow, so what better time to host a spring block party at the Mill? On Friday, March 21 from 4-8 p.m. please join us for to celebrate spring! We'll have food for sale from Squaw Valley's MtnRoots Food Truck and Crest Cafe and Catering, live music, a photo booth from the Mill's resident photographer, Jason Abraham from Elevated Image Photography, autograph signings from U.S. Ski Team members, and more. All are welcome. How to Select the Best Entity for Your Small Business: A presentation on forming a business entity that insulates you from personal liability and creates more flexibility for your business. Attorneys Brian Hanley and Ravn Whitington of the Truckee law office of Porter Simon P.C. will discuss the benefits of various legal business structures, such as sole proprietorships, partnerships, LLCs, and corporations, and will highlight how to avoid common missteps that could leave you exposed to liability. Guidance on how to go about forming a business entity will also be offered, from using internet sites to retaining local counsel. Come mix and mingle with other entrepreneurs and start-ups in the Tahoe/Truckee area. This will be a precursor happy hour to Startup Weekend Tahoe, which will be held March 7-9 in Truckee. Startup Weekend Tahoe is a 54-hour event where developers, designers and business development folks come together to pitch, generate business models, validate the models, build prototype products and launch a business, all in one weekend. It is a great opportunity to test start-up ideas, network with area entrepreneurs, build the start up community in the region and who knows...maybe launch a company! Check out more on Startup Weekend Tahoe or get the latest updates on their Facebook page. Porter Fox book reading, "Deep"
Powder Magazine editor Porter Fox will be doing a reading and talk about his new book, "Deep: The story of skiing and the future of snow." In his stunning first book, veteran ski writer Fox captures the 8,000-year-old sport of skiing, the miracle of snow and the shocking truth of how climate change could wipe out both in the next 75 years. Read more at http://deepthebook.com.